A look at the bus map on the wall of the hostel confirms that there was a bus to Hawes from Kendal! 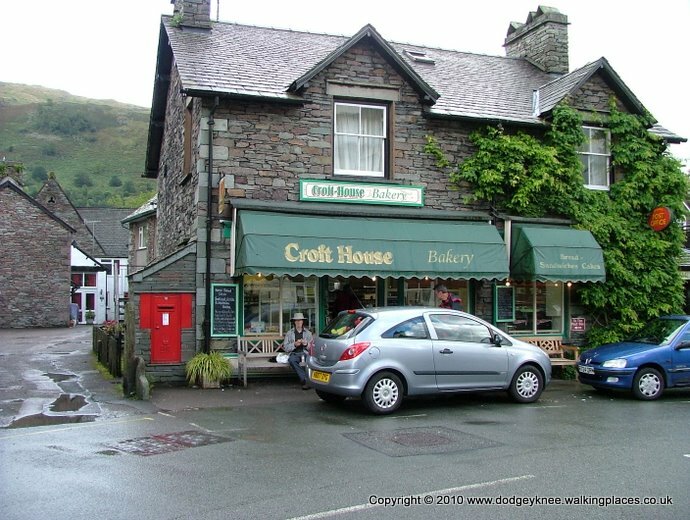 Nice day, if a little showery (well it would be, we weren’t walking, were we) We explored Grasmere. Very nice. We then raided first the bakers and then a coffee shop. Just as we finish our bus turned up. Perfect timing. At Kendale we ask about the bus to Hawes. Replies of ‘You’ll be lucky!’ and the like are followed by a ‘best alternative’ of a bus to Kirkby Londsdale and then another to Ingleton and ask again. 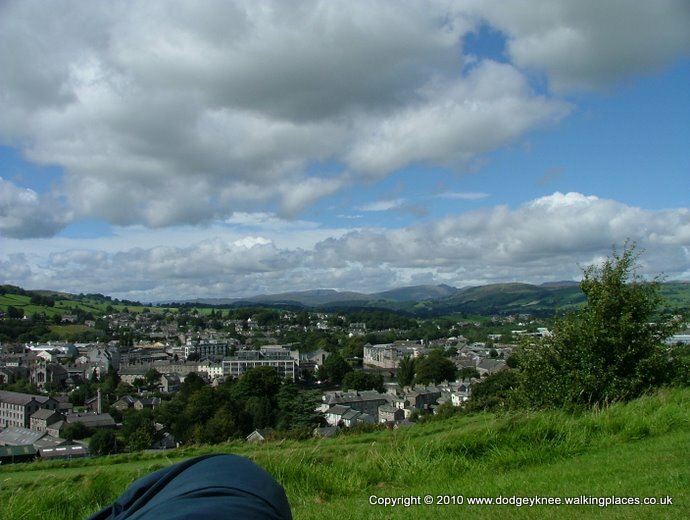 We had an hour to wait at Kendal so we lunched on the hill at the castle overlooking the town. 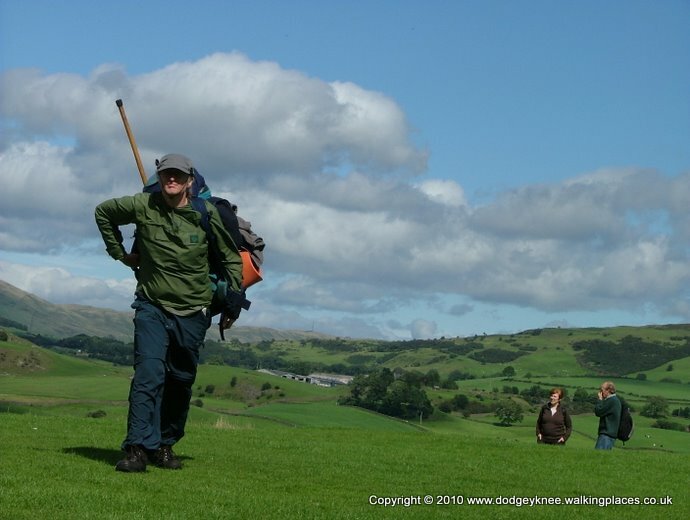 After lunch, and with 15 minutes to spare we aimed for the bus, David suddenly needed the loo. The bus finally arrived and David was nowhere to be seen. The bus was now due to leave.... and here he came. Mike then tried to dive on the bus but his pole (non collapsible) on his pack, sticking up like a flag pole, interfered with the roof of the bus. Meanwhile David retrieved a jumper he’d left on a wall while Mike waved his arms around and tried to reach his stick without taking his pack off. These Keaton-esque slapstick antics produced many laughs from our audience at the bus stop, before we finally got on. Kirkby - the town was getting ready to celebrate the 70th. anniversary of the Battle of Britain with a growing number of Union flags hanging from shop fronts and offices. David celebrated by buying some handmade chocolates that had no taste. We arrived at Ingleton late in the day (about 6:00). We tracked down the YH but they had no beds. At the tourist information centre, where the bus dropped us off, we noticed there was a list of B&B’s that had rooms for the night (well, only one, really) so we phoned them up. They were a little way out of the town they said, about two miles. But there was a shortcut through the fields. It still took us what seemed like an hour to find them! Nice place, another £27.50 each though. We talked to the farmer’s wife about farming. Mike can’t see himself ever taking up farming! Good grief, they work longer hours than the film industry! We also found out the advantage in making silage instead of hay: To make hay you need a week of good weather to dry out the grass properly, which they seldom get, and they can’t hang about in the hope they do because the longer they wait the more the ‘goodness’ goes from the grass. 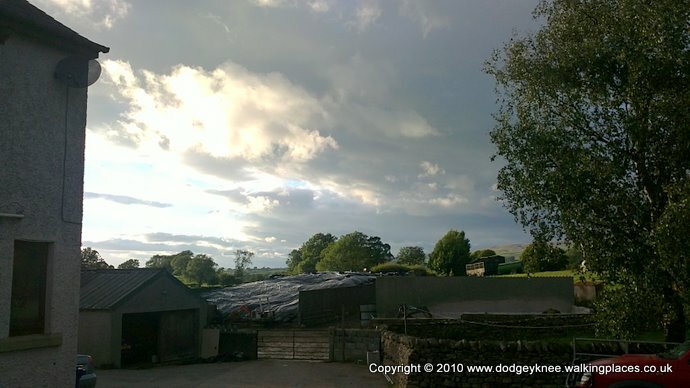 Silage is damp grass wrapped up airtight so it ferments. I guess it gets preserved the same way beer or maybe cheese does. Washed and changed, we found out the nearest place for dinner was back in Ingleton and as luck would have it there son was due to go out in 5 minutes and would give us a lift! Took a torch. Nice pub (The Something Arms), good food, good beer. Tempted by the puddings, David succumbed but Mike was stuffed. There was a birthday celebration going on in the other end of the pub with Sooty and Sweep providing a cabaret. Two miles in the dark seems like an awful long way, but the skies were fairly clear and with a full moon to help us, we were soon in our room. I could have done with a cup of tea but there were no facilities in our room. You’d have thought for £27.50 each there would have been... We found them the next morning hiding in a cupboard. Oh well. Copyright (c) 2008 www.walkingplaces.co.uk. All rights reserved Design by Free CSS Templates.